Getting out of Bogota was easy thanks to Mauricio’s map and the help of my friends at the Capital Hotel. I had noticed it earlier at the Girag office at the airport, but I finally figured out what was going on. In many of the Latin American countries I’ve been wandering through police officers are donned with reflected vests — particularly those that are directing traffic or are simply “transito” cops. 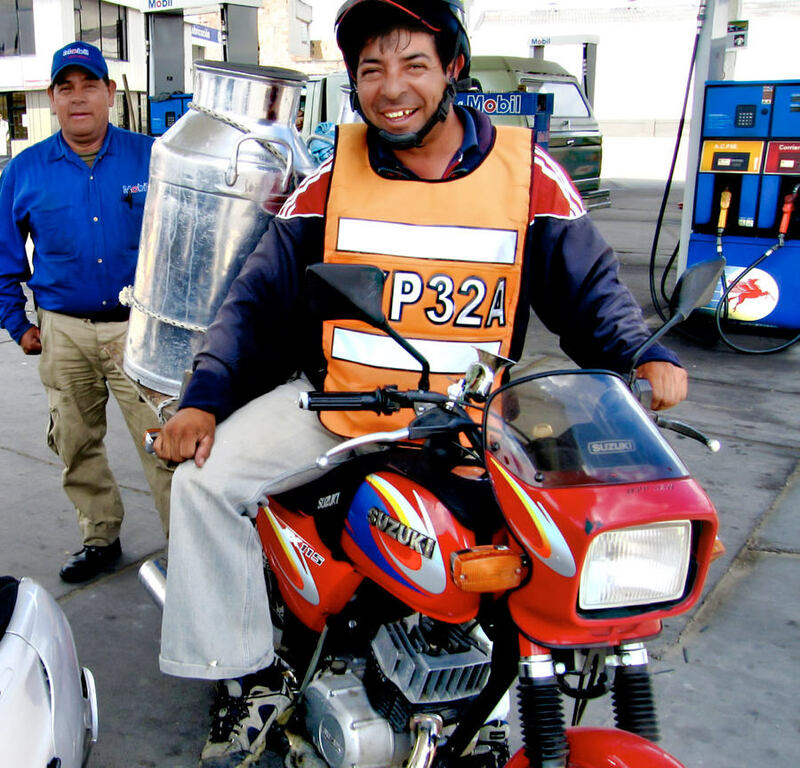 But in Colombia I noticed virtually everyone had a reflective vests displaying a series of numbers. At first I thought all that talk about how dangerous Colombia could be had certainly prompted an insanely large police force, but closer examination revealed something more interesting. Every motorcyclists and his/her passenger wears a vest sporting the digits and letters of the bike’s license plate. Even more, the helmets of each of these riders and passengers were stenciled with the corresponding plate numbers as well. My lack of such riding apparel would certainly make me standout as the odd ball here in Bogota, but it wasn’t until I had a chance to take in the hospitality, conversation and food of the local people did I learn more of the story. Years before Hugo Aguilar sent a bullet from his 9mm pistol atop a building in Medillen, Colombia ending the life of the most notorious and dangerous drug lord in history, Pablo Escobar would routinely send his hit men two-up on motorcycles through the city streets of Colombia killing police and government officials. The gunman and his get away rider were cloaked in protective motorcycle identities and could zoom through traffic and disappear as quickly as they appeared. To counter Escobar’s assassins, the government required all motorcyclists to don the vests and the inscriptions of license plates on helmets. e from the collective Colombian memory. Over an amazing lunch of traditional Medellin treats such as sausages, beans, pork and deserts of cake, caramel custard and fruit Mauricio explained that for most Colombian’s, current president Álvaro Uribe Vélez has dramatically and positively changed life in Colombia. From negotiating with leftist guerilla’s and right-wing paramilitary groups, to increasing military presence in areas commonly afflicted with violence and rampant kidnappings, evidence of Uribe’s efforts are everywhere. But Mauricio and countless other Colombians I talked with are in love with their country and want to share it with the rest of the world. Perhaps unfairly or perhaps deservingly, Colombia isn’t high on the list of destinations for vacationers from Europe or America. But that’s changing as Uribe continues his efforts to sweet the country clean. 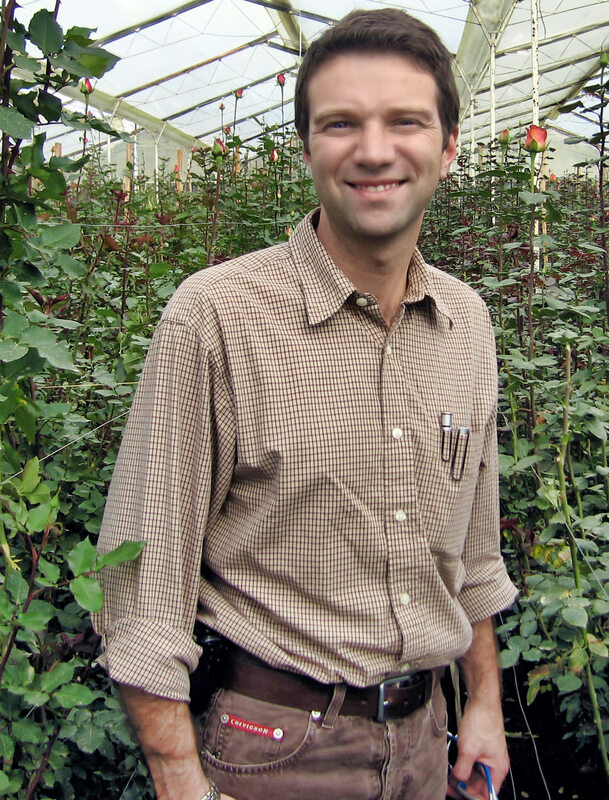 He has programs designed to teach ex-drug growers how to grow coffee, flowers, vegetables, coffee or graze cattle. There are enough sweeping changes in this country that they are voting on changing the constitution to allow a president (Uribe) to run for a second six-year term. No expert on Colombian politics and my short stint in this country hardly enough to truly take the political pulse of the country, but my new friends have convinced me a second term will be good for Colombia and good for the rest of the world. 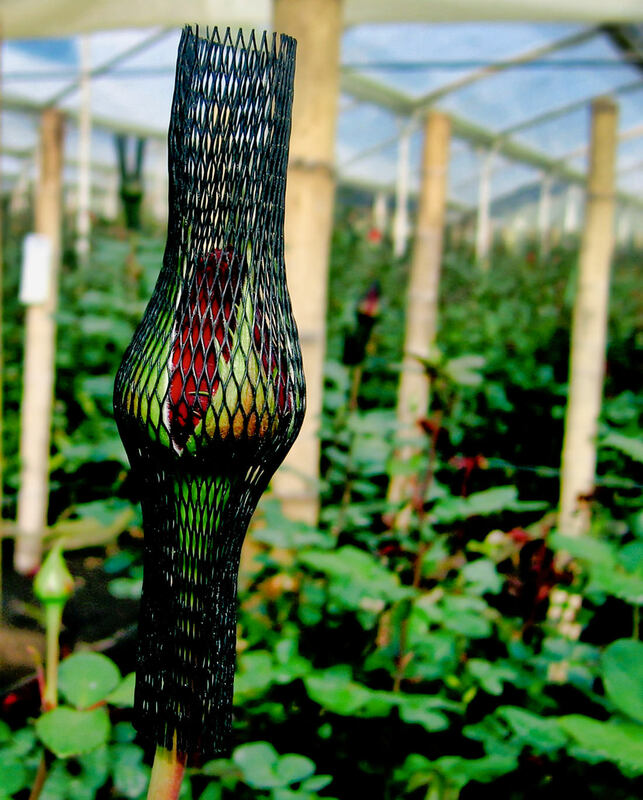 Walking through the greenhouses of Finca de Provenir (Falcon Farms) I can see Colombia is serious about business. 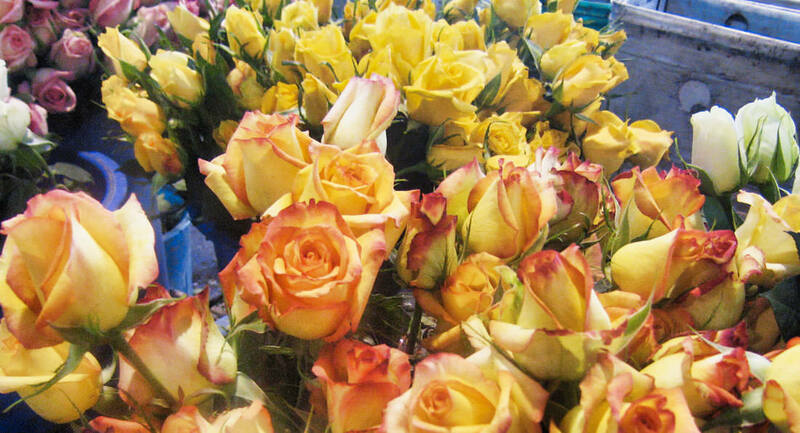 With locations in Colombia and the United STates, Mauricio’s employer is perhaps the largest supplier of roses to major retailers like Wal-Mart, Safeway, Target and more. Dozens of rose varieties are grown under the Colombian son, harvested, packaged and even bar-coded and priced specially to the retailers requirements and sent to the U.S. via airfreight over night so that you can buy fresh flowers at your local supermarket or Wal-Mart. Today Mauricio explains that the farm is working to hold back the growth of the flowers so that the harvest prior to Valentines Day will be sufficient to meet the demand of once-a-year flower buyers that flock to florists and crowd restaurants on the hottest flower selling day of the year. As the sun slowly sneaks it’s way west, Mauricio and I bid farewell but committed to staying in touch and agreeing a follow up visit to both Bogota and Medellin is a must, I take the mile long dirt road back to the highway and make my way to Manizales with tenacity and hope I can arrive before the street lights come on. By the time I roll into a Honda, still a couple hours from Manizales a crowd circles me by the side of the road where I’ve pulled over to glance at the map. As I make my way toward Manizales I happily discover that even though I’m on a “toll-road” motorcycles pass at no charge. The first time through a toll booth the panicked toll-take stpes out of his booth frantically flapping is arms and guides me through a narrow opening between the guard gate and the adjacent toll booth. He was afraid I’d hit the trip. By the time I got to the second toll booth, a less panicky taker points me to a narrow but special lane build just for motorcyclists to slowly pass through sans payment for passage. “Tiene que cambiar su ruta,” the middle aged man with a slight paunch tells me. He’s trying to explain that I must change my route because of something. I can’t understand his words. I ask him if it’s rain, banditos or what? I finally realize that the road is under construction and there’s much fog after 4pm. He tells me the road is closed, too. I scan the dumpy, busy and noisy town for a hotel. Next thing I’ve got a 13 year old boy eager to show me the towns hotels. Like a moth on a light, I can’t shake him. Later an older boy speaking English asks me if I trust him, and wants me to follow him to a hotel. After examining two motels all tucked down corridors on third floors with scantly a window and a musty odor, I break away and ride toward Manizales until settling on a peaceful campestre set above a river, near a canyon. I’m the only customer in this beautifully landscaped “resort”. I take a dip in the pool which prompts aerobatics and nose diving bats to alert me of their presence. Tired and tuckered. I pass out. 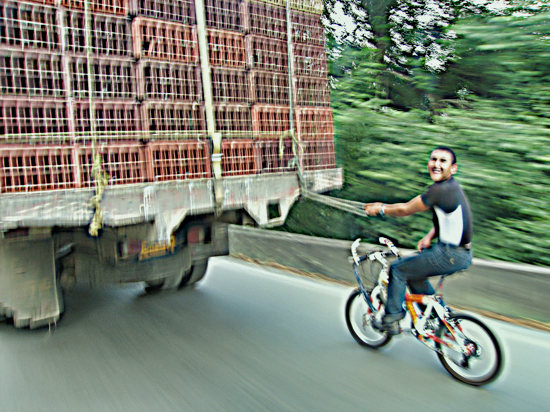 Photos: (1) Delivering leche (milk) on his motorcycle, this rider wanted to know if I’d trade. Notice the vest with his license number; (1) Mauricio Sanchez, Horizons Unlimited regional contact in Bogota;(3) Roses your way at Finca del Porvenir outside Bogota; (4) The hills climb steeply as you head west from Bogota. This rider decided to “hitch” a ride. Welcome To South America — Hello Colombia Armenia, Colombia: Where is Juan Valdez?